“The Selvaccia” is in a privileged position compared to the most important cities d 'art and landscapes of Siena and the Chianti representing the' image of Tuscany in the world. A 64 km from Florence - It will take 60 minutes (you can also easily use the train). In 'lodging, a renovated barn with great love by the owners, respecting in full the characteristics of Tuscan farmhouse, preserving the original materials, such as cooked for the floors and wood for the beautiful ceilings with beams typical of Tuscany, reserved exclusively guests, is available on the first floor, wide and bright bedroom. From the terrace you can enjoy a breathtaking panorama that sweeps from the surrounding countryside to the mountains of Chianti and Pratomagno. The other rooms are a comfortable living room with a sofa bed that can be used for 2 additional posts, a warm dining room with a beautiful stone fireplace, kitchen, practical and equipped with all appliances, bathroom with shower, located on the ground floor where you can access the green and well-kept garden, and where are they grown vegetables excellent products available to guests. Great place to stay in Tuscany!!! What a wonderful time we had at La Selvaccia! It's like traveling into past times but with all modern amenities. We enjoyed every moment being there. The location is excellent for day trips in Tuscany and very private and quiet when you want to relax and do nothing. We will never forget an amazing view from the terrace while having our morning coffee. Anna and Marcello are great hosts. They made us feel at home. The kitchen has all equipment you might need. I wish we could stay there longer. We will definitely recommend it to our friends and will come back one day. 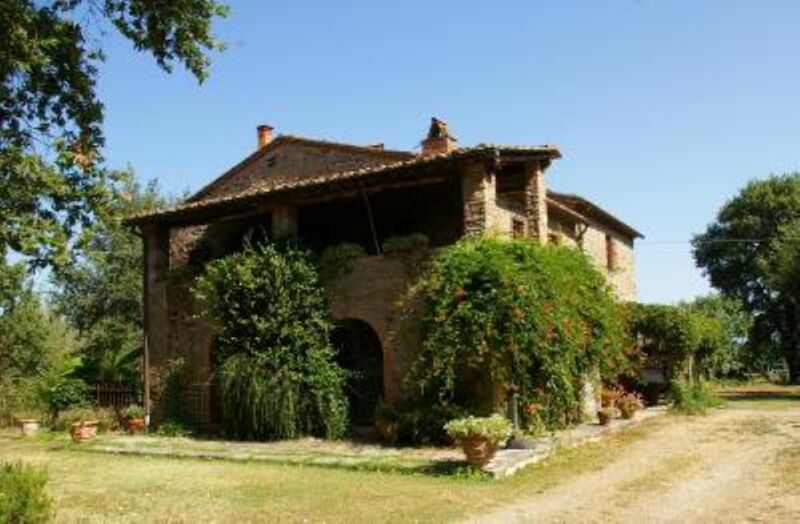 "Very spacious and comfortable house in the heart of a quiet part of Tuscany. There is plenty of room to relax in the grounds, and the house is equipped to high standard, with every amenity. Ideally situated for visits to Siena and Arezzo and the Chianti region. The Owners'' live close by and are most courteous and helpful. Good way marked paths and bike routes all close to the house." C''est encore mieux que sur les photos! Nous etions avec deux enfants de 5 et 7 ans. C''etait un coin de paradis pour eux!" "La Selvaccia: pour nous ça veut dire certainement vacances de rêve. Cadre magnifique, maison très bien équipée et très bien située dans la région de Chianti. Idéal pour ceux qui sont à la recherche d''un mélange de culture (dans tous les bons sens), nature et repos. Mille, mille grazie à nos hôtes plus que parfait Anna et Marcello, pour l''accueil et la compagnie très chaleureuse: nous leur devons nos plus belles vacances et espèrons de revenir l''année prochaine." "Le logement était en harmonie totale avec la description. Les propriétaires sont charmants et attentionnés (toujours présents au besoin sans être envahissant du tout).Fiez-vous à leurs conseils sans aucun problèmes. L''endroit est reposant et la nature au rendez-vous. Une voiture est nécessaire." "Un endroit merveilleux et relaxant, avec des propriétaires chaleureux et bienveillant! L''habitation est superbe et très bien équipée. La vue y est magnifique, et l''endroit est tres bien situé pour explorer les environs durant le jour et y relaxer le soir venu. Nous le recommendons fortement à tous, et en particulier à ceux qui recherche un endroit calme et reposant." Coming from the South Autostrada del Sole Valdichiana exit, follow signs for Foiano della Chiana, Rapolano Terme, Siena continuing SS 327/SP 327. At the roundabout take the 1 ^ exit and continue on Raccordo Siena-Bettolle until the Column Grillo-Bucine. From there it continues for about 500 metres on SS73 / E78 and then turn left on SP540. After about 8km, once all 'height Pietraviva, turn right direction RIMACINI. It takes the right along the Torrente Ambra and after about 1.5 kilometers, you have arrived at Podere La Selvaccia. In 'absolute peace and tranquillity of the Tuscan countryside, surrounded by forests of oak and chestnut trees, vineyards, olive groves and fields where horses graze the farm, in our structure will be only 2 or 4 if you have decided you. A good place to find the intimacy and a taste of life in contact with nature and warmth of 'hospitality. The territory is proposing a billboard full of initiatives for tourists and residents,: village festivals and fairs in villages and neighbouring areas, guided hikes in natural areas protected concerts, exhibitions, markets for local products, wine tasting. For those who want to visit the outlets and shops of the most important brands, this is possible only a few kilometers away from here. A Montevarchi l 'Outlet of PRADA, MIU MIU, in Incisa Valdarno to DOLCE & GABBANA, near a mool with shops on many important signatures. E' prevista una tassa di soggiorno di 1,50 € per persona per un massimo di 4 notti.